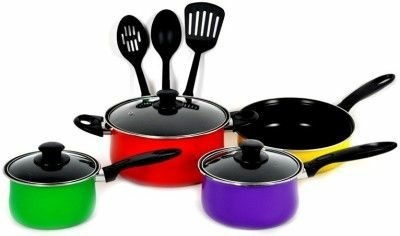 A fabulous Non Stick Cookware Sets from Everwel for a wonderful cooking experience and to suffice the needs of any family. This set includes every essential utensil that is required in the kitchen, while cooking, serving and even storing. It holds the mark of high quality and innovation with its superior construction and design. The food grade quality makes it safe for young and old alike. It is crafted from high quality stainless steel and sports a royal silver finish. Undoubtedly a great addition to your kitchen. Pick it and let the art of cooking be enjoyable and a celebration every day. Saravana Store is ranked amidst the distinguished manufacturing, trading and supplying of products. We are a Sole Proprietorship based firm Since 1980. We are involved in offering a wide range of Kitchen Appliances, Electric Fan, Electric Home Appliances, Home Theatre and more. The offered range of products is highly known in the market due to the quality, finishing, reliability and more.